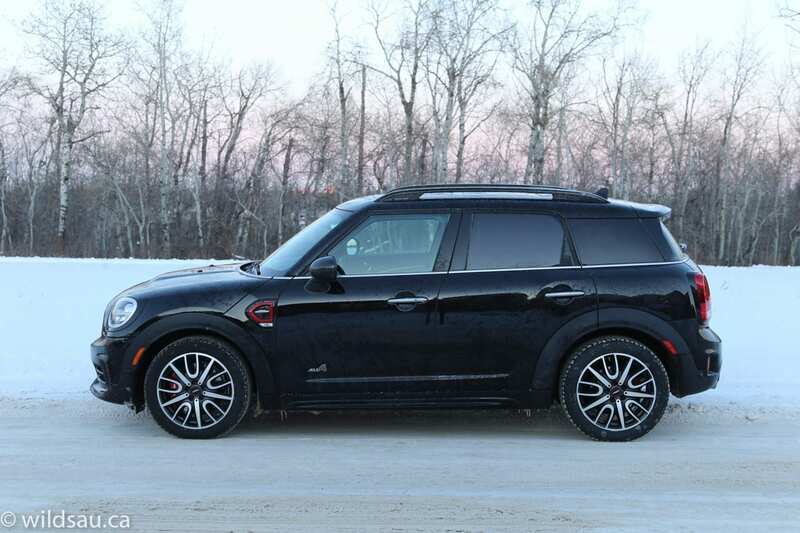 The sportiest version of the biggest MINI you can buy. Confused? I thought I’d get the pricing out of the way first. 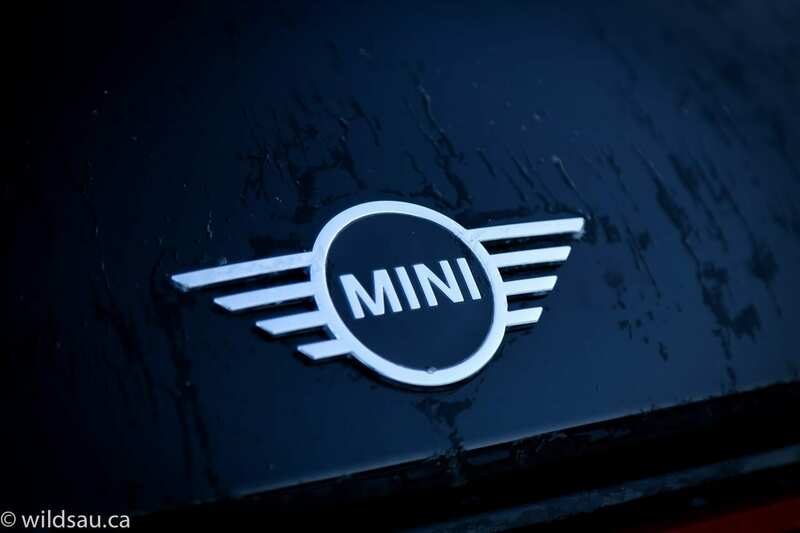 Yes, that is a very, very expensive MINI. The eye-watering total heads north of $50K thanks to the pricey Midnight Black Edition option package. 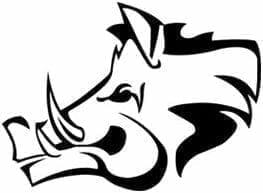 So let me tell you what that package nets you, should this be of interest to you. You get the black metallic paint, carbon mirror caps, head light, tail light and grille trim and black leather interior. None of this impacts the car’s performance so if you’re looking to get in on this on the cheap, skip that option and you’re hovering around $40,000 instead. This car gets a lot of looks thanks to its JCW-specific aero body kit and those big cooling intakes on the front end. It’s an aggressive looking car, to be sure. And that includes the handsome 19-inch JCW wheels fitted with 225/50-sized tires, which look huge for this car. 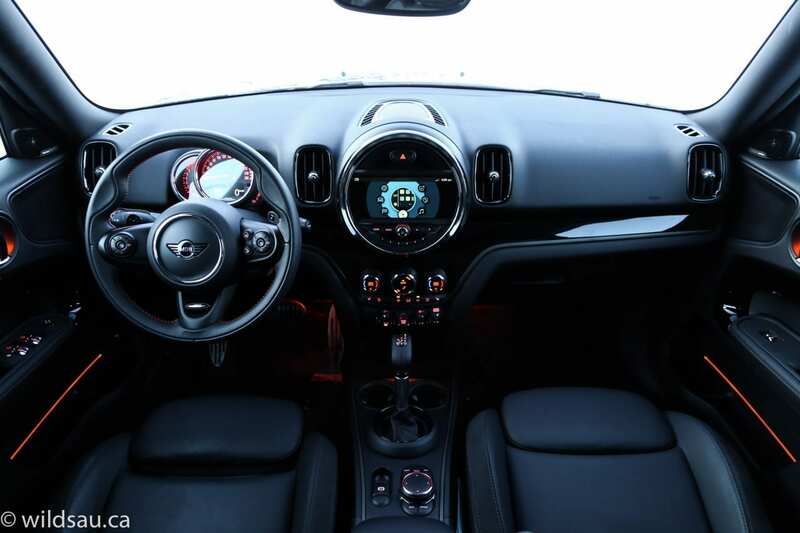 Inside, the MINI’s styling sticks with the circular motif – they seem to be in a lot of places. The materials are decent, not really world-class but there are plenty of soft-touch plastics and upholstered panels. 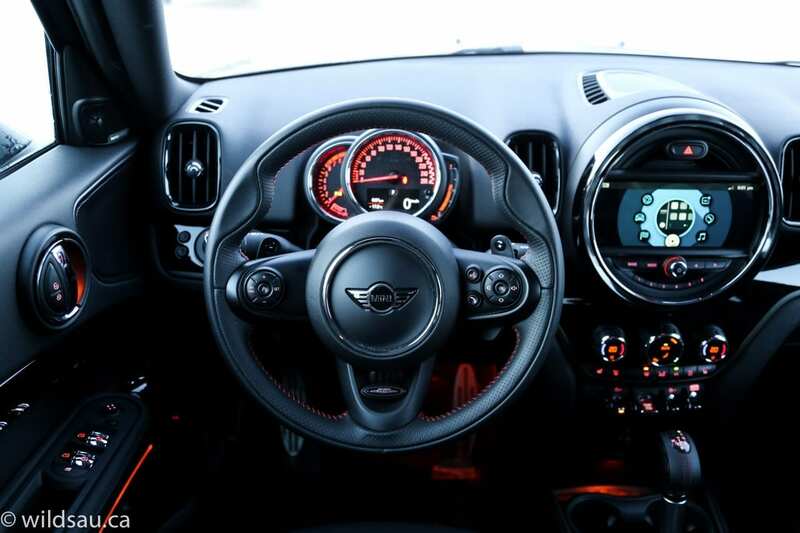 The steering wheel and gear selector are JCW-specific and I enjoyed both of them. 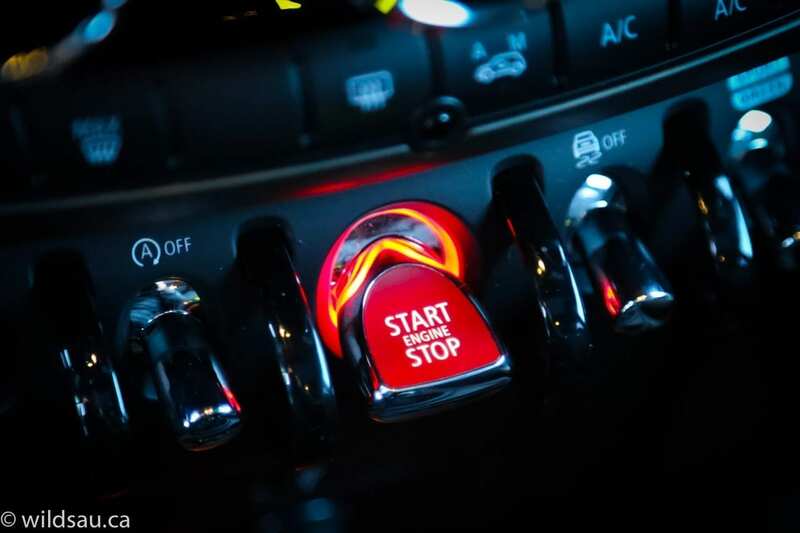 I like the little quirky toggle switches that MINI has stuck with for some of the controls – they’re easy and fun to use and they look cool. 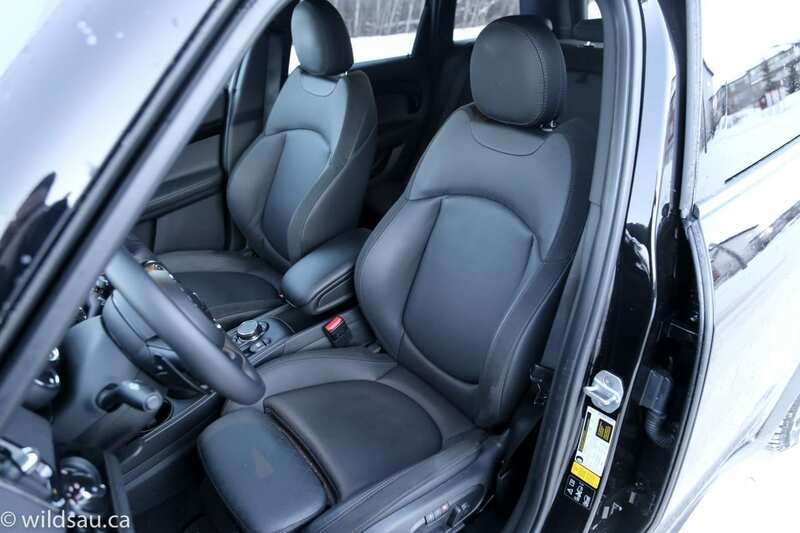 The heated leather sport seats are great – I appreciated the adjustable thigh bolster and found them comfortable and extraordinarily supportive for sportier driving. 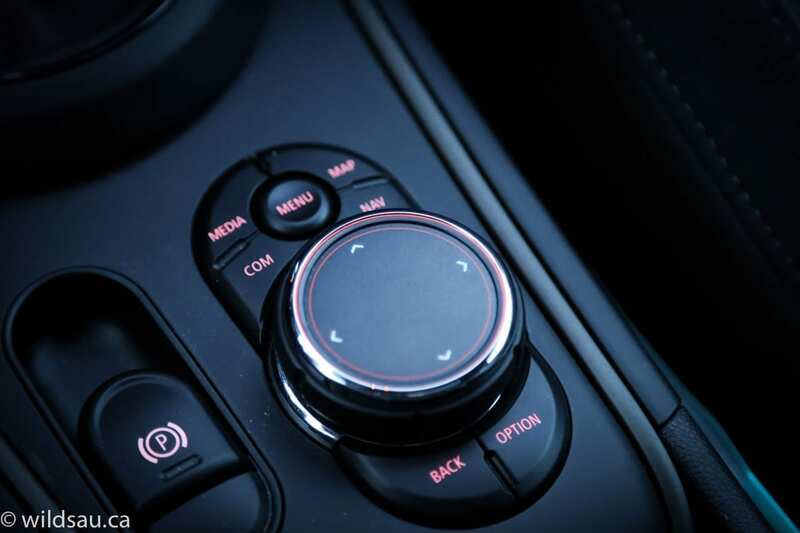 There’s an 8.8″ touchscreen in the centre “circle” which can also be controlled with BMW’s iDrive-based rotary knob on the console. 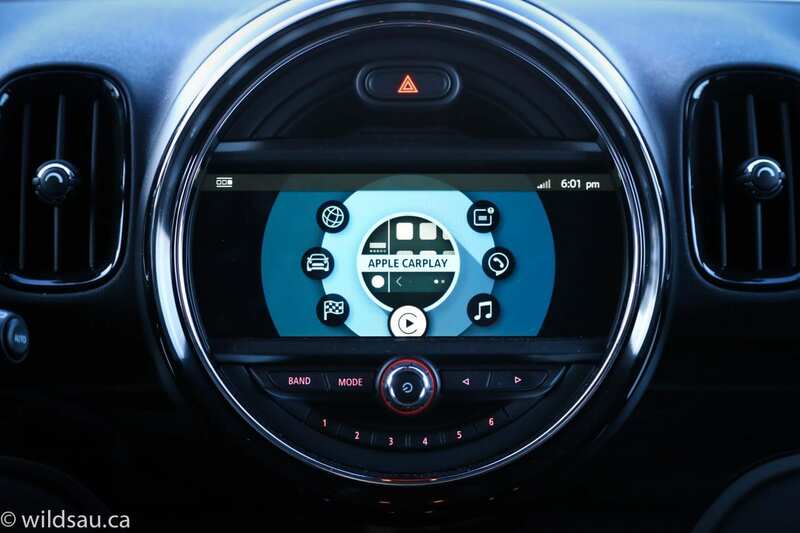 MINI brands this system as their own, but the whole thing is basically iDrive. It works pretty well once you get used to it. The Harman Kardon sound system is very good! Major shout-out for the Apple CarPlay integration – not only does it work beautifully, it’s wireless too. 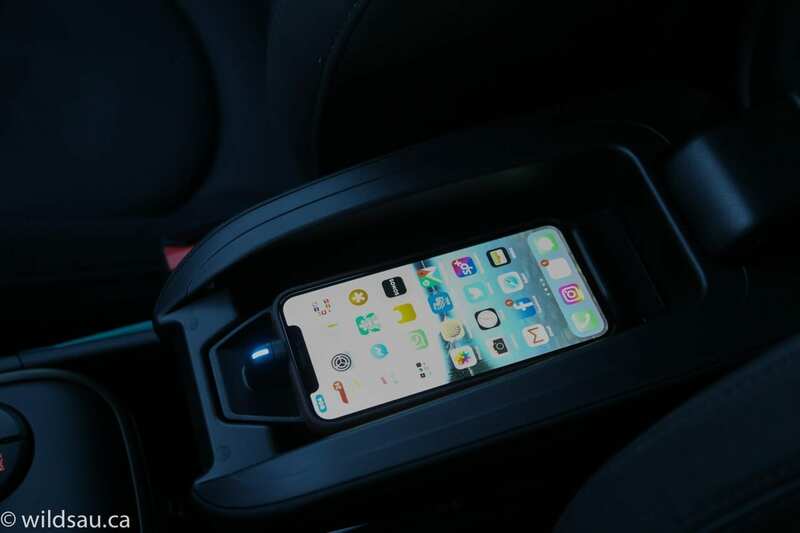 Yes, if your phone is in the car, it works. And that’s awesome! There’s a dual sunroof overhead which is pretty cool. Unfortunately, when we slid open either of the manual sunshades, there was an incessant rattling from the ceiling. So we left them closed. Driver assistance technology is pretty limited and leaves most things as options. You get a back-up camera with rear parking sensors. 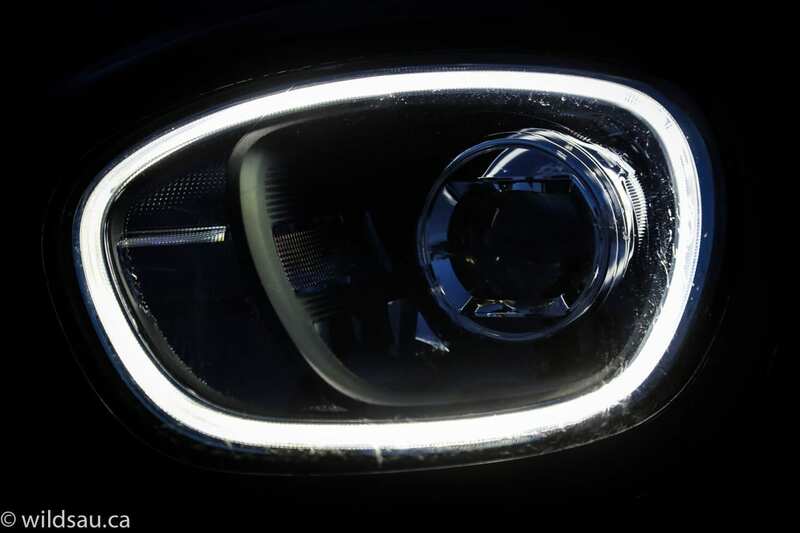 You’ll need to pay extra for things like a heads-up display, front parking sensors, parking assistant, adaptive cruise control, collision and pedestrian warning. 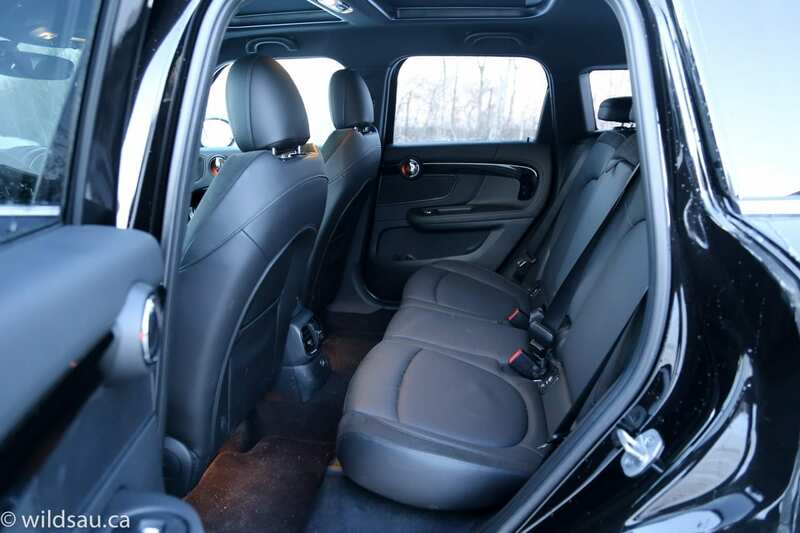 Now here’s a big surprise – space in the back is excellent with good leg and head room. Not only that, but the rear seats recline and slide fore and aft (they move up to 13 cm!). The middle seatback folds down to become an armrest with some cupholders and rear passengers get a 12V plug and adjustable air vents. At the base of the centre stack is a small open compartment with one 12V and one USB plug. The armrest is a floating entity and thus doesn’t contain any real storage – but if you pop its lid open, you will find a wireless phone charging cradle, which is great. If you swing the armrest up, you’ll find another open bin with a USB plug below. 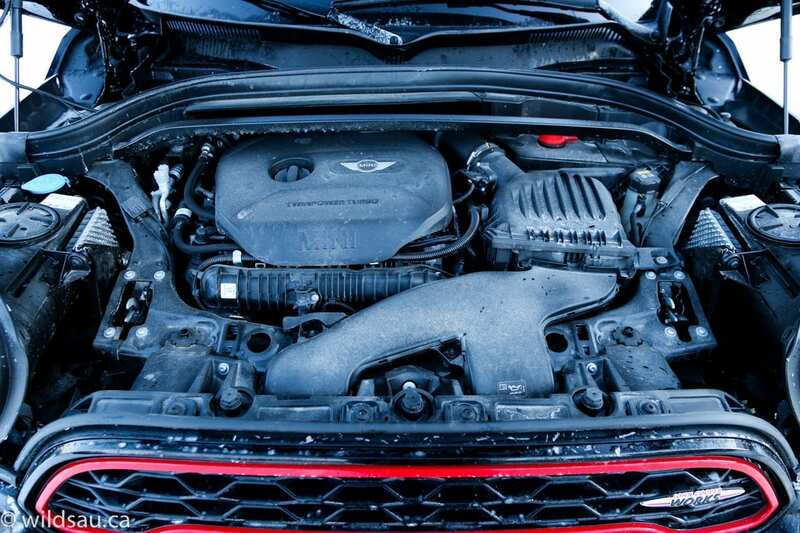 Pop the power trunk lid and you’ll find the trunk size is surprisingly generous at 450L and that’s not counting a huge amount of underfloor storage. 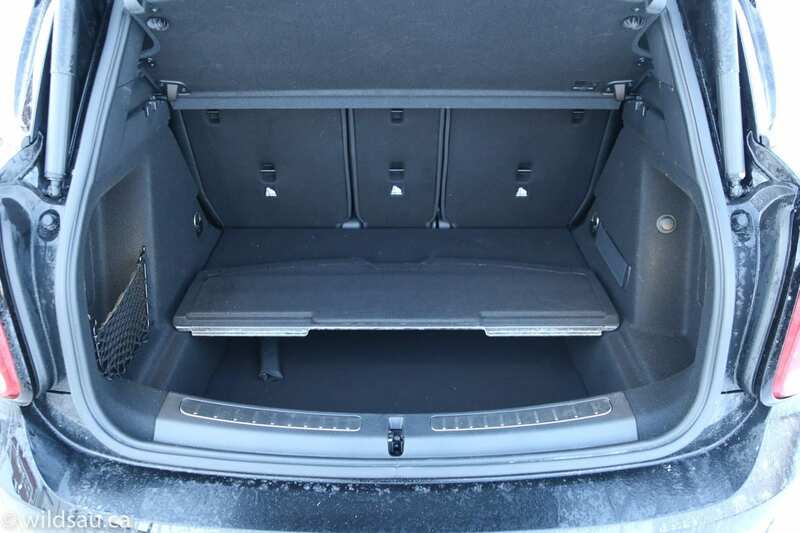 The rear seats split 40/20/40 – fold them flat and you’ll increase that cargo space to a shockingly big 1390L. There’s a 12V power outlet back there too. Here you’ll find a 2L turbo-4 that puts down a stout 228 HP and 258 lb.ft of torque, the latter available at 1,450 RPM. My review car had the optional 8-speed automatic transmission and they all come with the ALL4 all-wheel drive system. 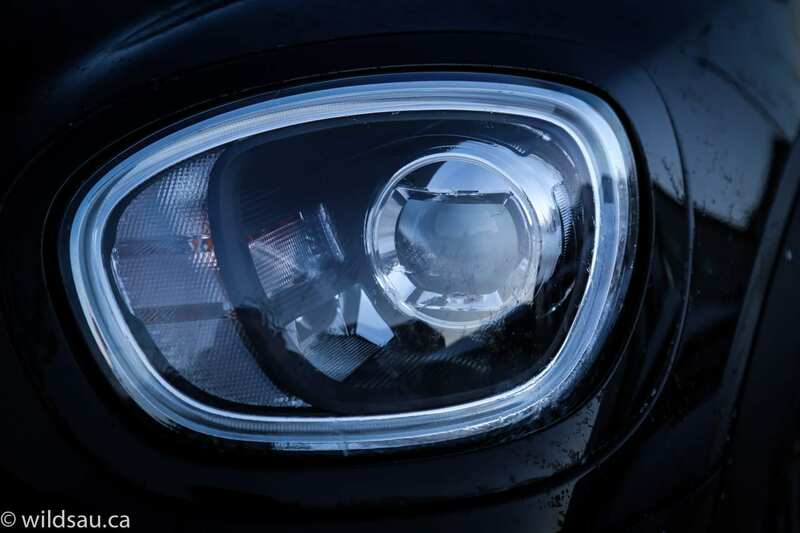 MINI says you’ll get 10.6/7.8 L/100 km city/highway in this combination. I averaged 11.5 L/100 km after a. week of driving with a heavy foot – I had fun in this thing. Of note, the journalist who drove this before me is pretty conservative on the road and averaged 9.8 L/100 km. That leads me to believe a typical driver will likely see something between those two numbers and so MINI’s numbers could be pretty accurate. 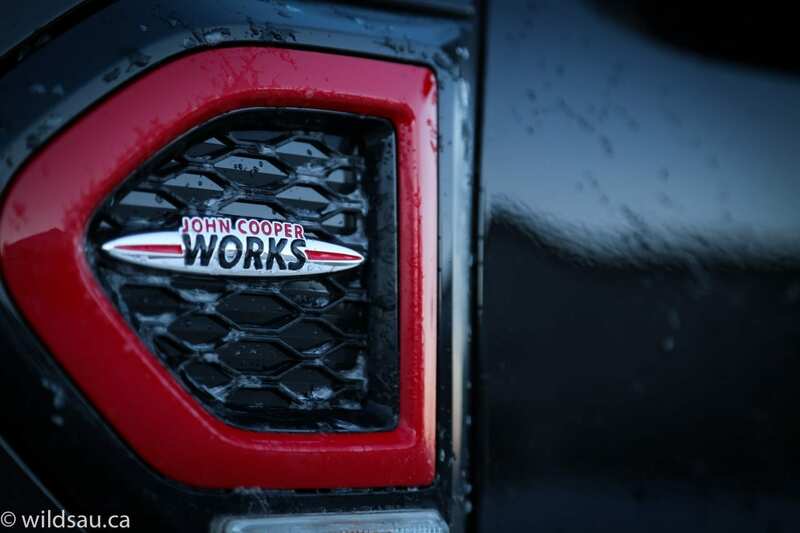 The JCW Countryman has plenty of power in every situation, particularly off the line. It takes 6.5 seconds to accelerate from 0-100 km/h but it feels faster than that. In Sport mode, the car becomes significantly more responsive in every way including the exhaust note. 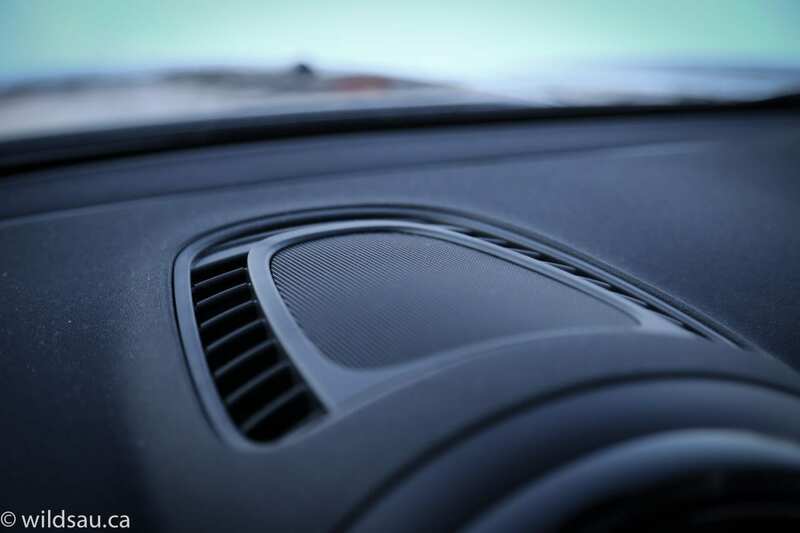 There’s a variable exhaust flap that immediately changes the tuning and sound. It almost gets noisy, which is a lot of fun – sadly, I do believe that some of those exhaust noises are artificially piped into the cabin. Either way, they do sound great. 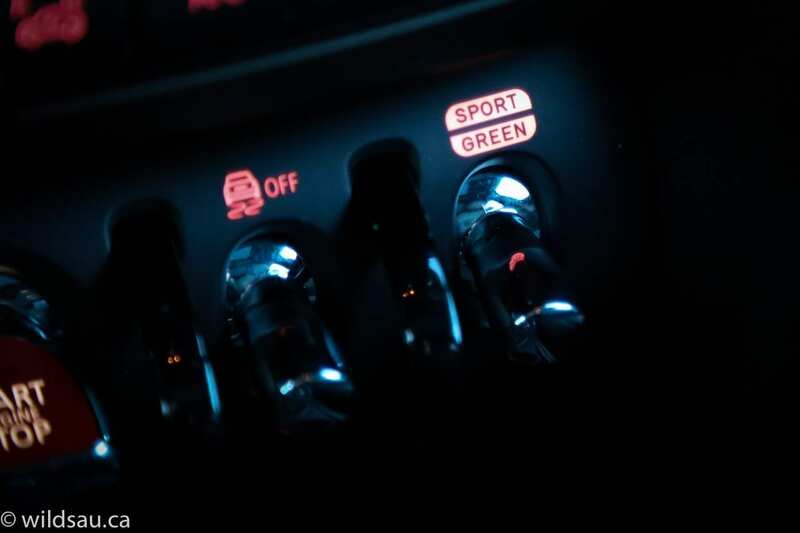 There are also the Mid and Green driving modes. The transmission is very good, smoothly and quickly shifting to what is almost always the right gear. 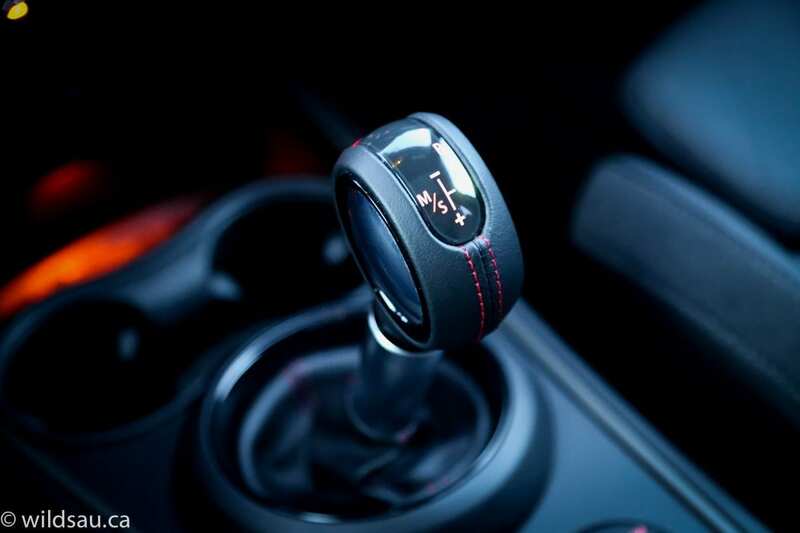 There’s also a sport mode for the transmission itself (which will hang on to gears for dear life before shifting) and you can shift manually using paddles or the gear selector. Let’s talk about the sport suspension. While it may excel in situations like track racing, it is absolutely awful to live with. It’s very harsh, reminding you of its presence over every single road imperfection. Never mind hitting a bad road with expansion cracks and potholes. It is one of the most unforgiving suspension set-ups I’ve ever reviewed and I tired of it very quickly. That said, the car’s handling is remarkably good. It does everything right in that department, but the compromise in the ride isn’t worth it. Particularly when you’re talking about the most utility-focused MINI product. I found the all-wheel drive system to be outstanding. 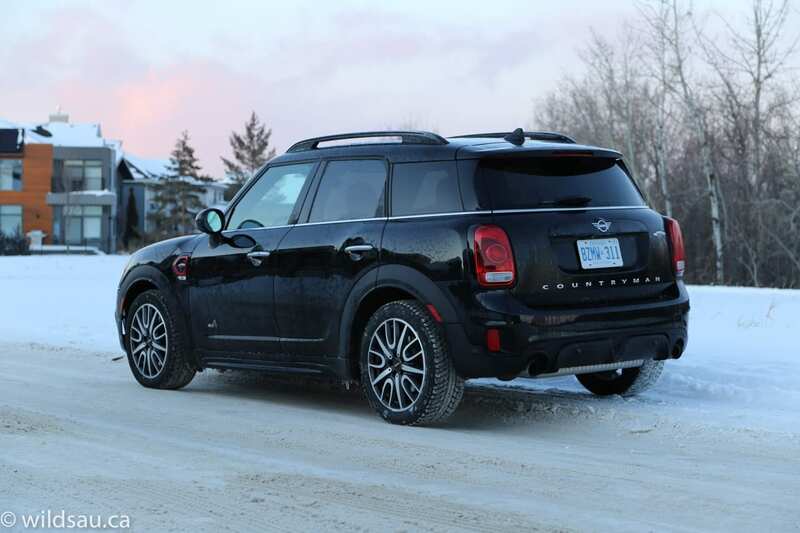 It sent power to where it was needed and provided tremendous grip on the icy Edmonton streets. 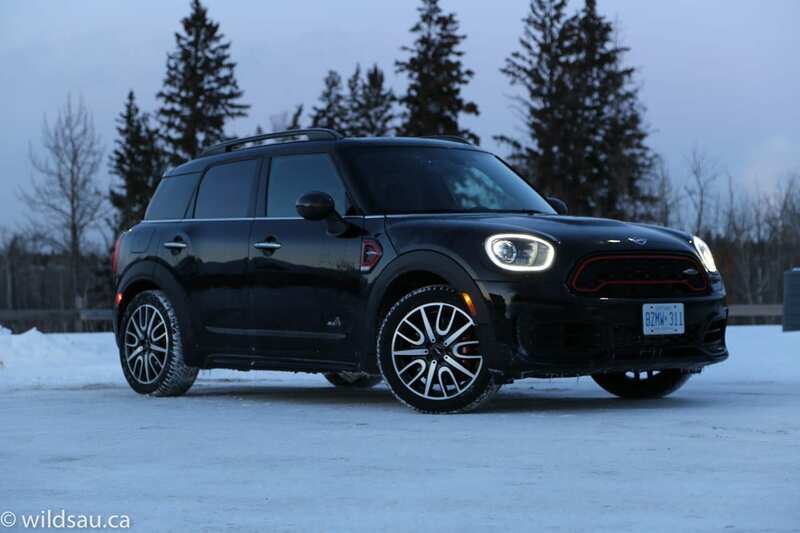 Instead of being boring, it actually makes this MINI a pleasure to drive, particularly in the snow where (when you turn the traction control to Dynamic) it will let you kick out the rear end and have some fun. 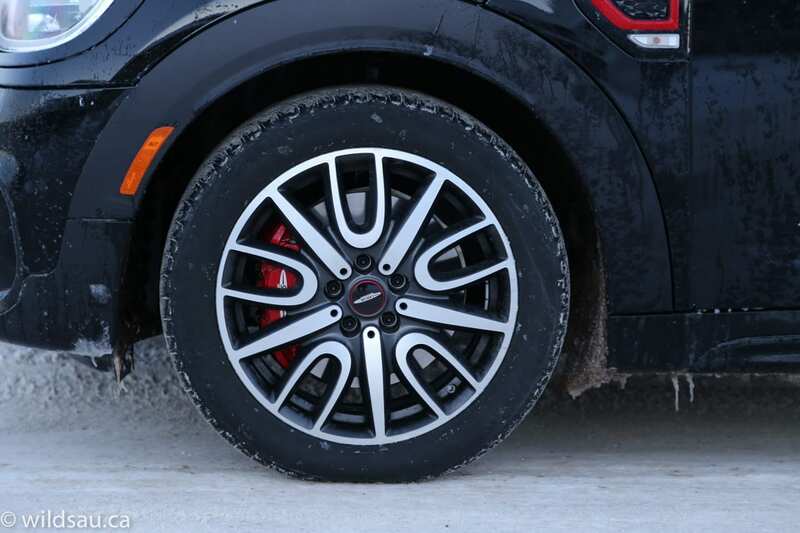 The JCW package gets you Brembo brakes and they are monstrously good at slowing things down. At first, they require quite an adjustment because they are so grabby. If you even think about the brakes, they will haul this thing down. They also look sweet with the red-finished calipers. WAF (Wife Approval Factor) was very low. She hated the ride and she didn’t like how loud it got in Sport mode, which is what I usually had it in. To be honest, my whole family hated it – mainly because of the suspension. It’s even more uncomfortable in the back. I don’t mind this car, except for the suspension. 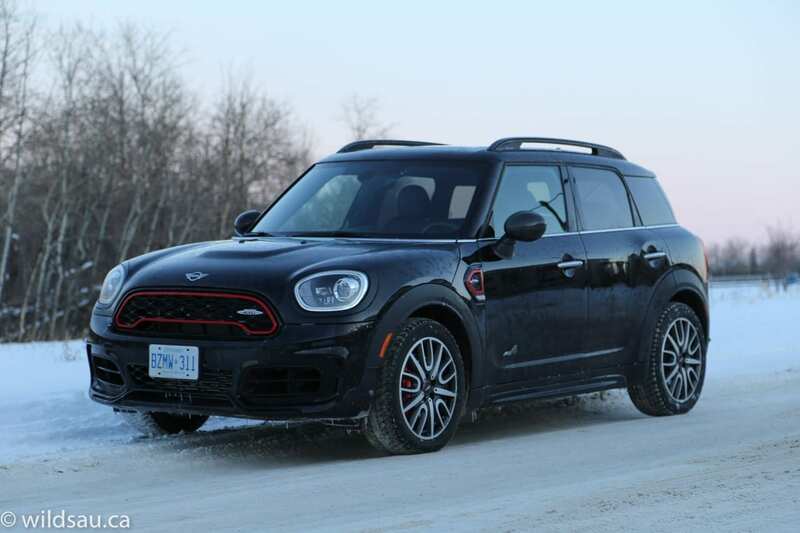 It would be great if MINI let you buy the Countryman with the JCW engine and delete the suspension. 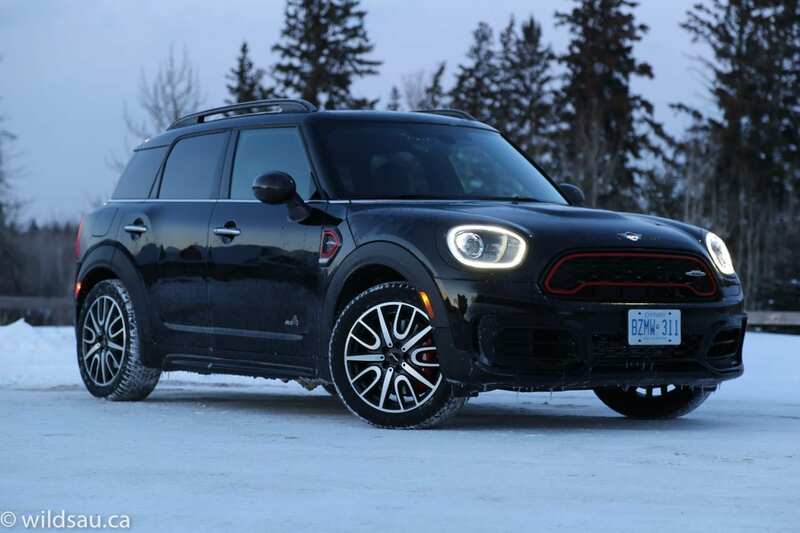 The Countryman already handles very nicely, and it would be a very satisfying car with this engine. I’m guessing virtually nobody that buys this car will ever use the brakes and the suspension anywhere near their limits. 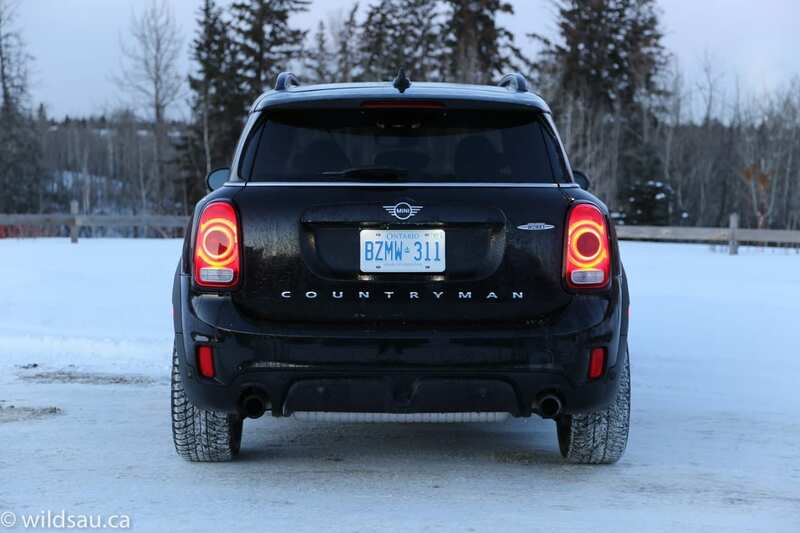 Anyway, I appreciate what MINI is trying to do with the Countryman, and for the most part, they succeed at it. It offers space, versatility and functionality. It is an exciting driving experience but I simply wouldn’t ever buy the JCW trim, as I found it hard to live with. 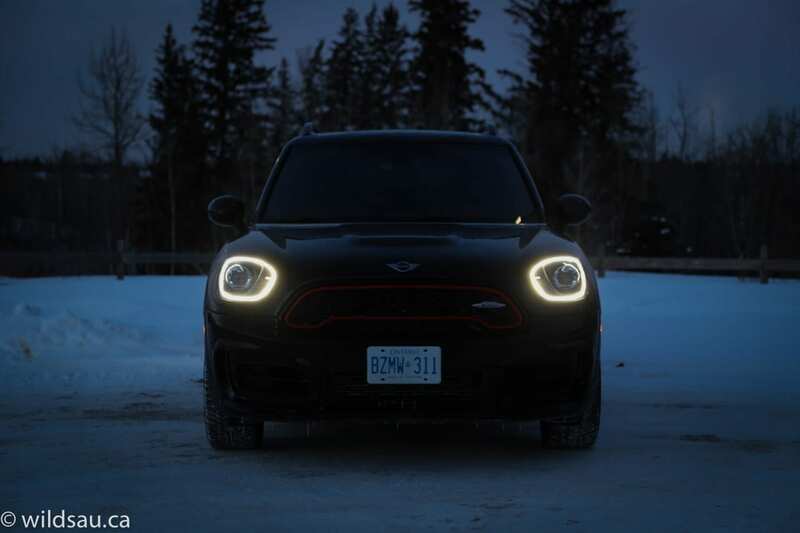 Disclosure: Vehicle was provided by MINI Canada.